The hospitality industry is one industry that demands an important quality in professionals working for the industry—hospitality itself! But how will you able to convince your employer that you really possess humility and other intrinsic traits that are usually required of hospitality professionals? You should know that in your job search you need to dress your resume effectively to land the perfect job. A resume and cover letter are the most important self-promotional tools in your hospitality career and you should look to an expert to draft them! Preferred Resumes provides masterfully crafted hospitality resumes and cover letters that cater to a wide variety of employers, including Fortune 100 and Fortune 500 companies. We cater to all types of professionals in the hospitality field like chefs, hotel managers, waiters, cooks, suite managers, customer service professionals, receptionists, etc. 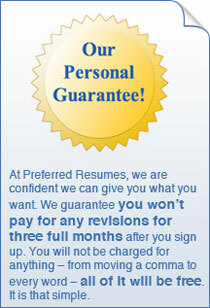 Thousands of job seekers rely on our resume service because we are far ahead of others in the industry. This is because we have immense experience in writing resumes and cover letters for thousands of hospitality professionals. After signing up on Our Services page, you will be asked to fill out our detailed questionnaire, which will elicit important information related to your hospitality career. Additionally, you will need to upload your existing resume/cover letter for our writers to get a clear picture of your writing style and your background. Your work ends here! In the next five days, you'll receive a new "you." Our professional writer will give your hospitality resume and cover letter a complete makeover. "Great job, everyone! Thanks to your help, I just received an offer that I was dying to interview for. Not only did I get the interview, but I got the job as well. This is all so wonderful! Thank you so much for helping me get this opportunity. This is one of the best things that has ever happened to me."